Variability in a vineyard should be embraced as an opportunity – and not seen as a negative – says one of the world’s leading precision viticulture experts. Dr Rob Bramley has been studying detailed vineyard variability for nearly two decades, and says the variability of a vineyard presents a unique opportunity for growers and winemakers – ‘and one they should consider grasping’. ‘By knowing their vineyard’s spatial nuances, growers and winemakers can fine tune their management and winemaking practices to suit each individual zone’, said Dr Bramley, Senior Principal Research Scientist in CSIRO’s Integrated Agricultural Systems program here at Waite. Precision viticulture refers to the use of spatial information to monitor conditions in the vineyard and then make management decisions based on variability in those conditions between different parts of the vineyard instead of treating all areas equally. In a recently completed project, Dr Bramley and his team sought to understand the ‘yield:quality nexus’ – the presumed link between fruit yield and quality, where it is said that higher yield means lower quality. ‘Our approach was to use the tools of precision viticulture – including yield monitoring, remote and proximal canopy sensing, the global positioning system and methods of spatial analysis – to see whether links between fruit yield and quality could be established at the within-vineyard scale. 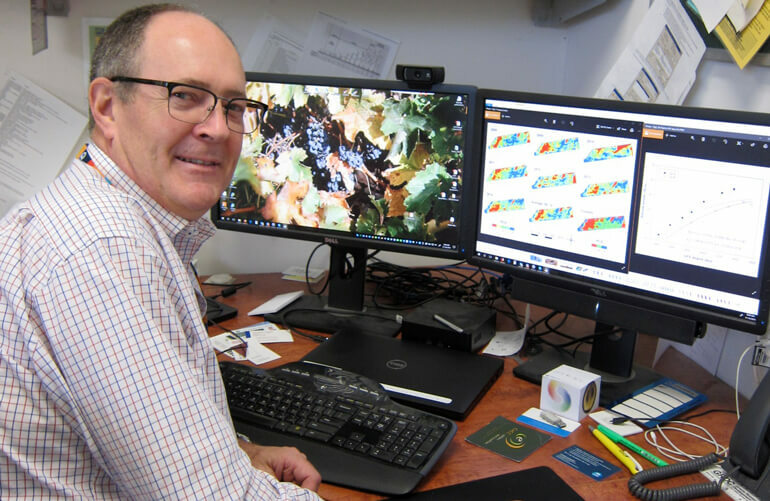 He is currently leading another project – funded by the Australian Government Department of Agriculture and Water Resources as part of its Rural R&D for Profit program and Wine Australia – to develop a set of ‘user-friendly’ spatial analysis tools that are relevant to the wine sector, accessible and feasible for general use. While these spatial analysis tools are still to be released, Dr Bramley said there were many cost-effective technologies already available to growers. Dr Bramley said he looked forward to the day when growers and winemakers think of the tools and techniques we now think of as ‘precision viticulture’ as just part of the standard winegrowing toolkit.